As a taxon proxy, bacterial 16S rDNA based profiling has been widely used for characterizing bacteriome in a metagenomic microbiota. The method is sensitive but limited to bacterial taxa and prone to PCR bias. It is inaccurate for quantifying the abundance of various taxa in a microbiota. Here, we introduce an NGS shotgun sequencing approach to characterize microbiota. The metagenomic shotgun reads can be de novo assembled into contigs and scaffolds for taxonomy and gene annotation. Since all the taxa in a sample are subject to sequencing, this approach is taxonomy unbiased. The taxonomic representation, although dependent on sequencing depth, is very close to the reality. Genetic capacity in a microbiota can be unraveled by gene function prediction based on metagenome contents. This webinar will feature examples of metagenomes from wild caught Aedes albopictus and Anopheles gambiae. 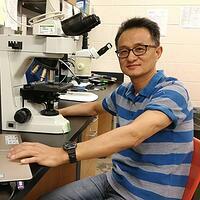 Dr. Jiannong Xu is a mosquito biologist working on functional genomics of mosquito immune system and vector competence. His work focuses on mosquito associated microbiota and the symbiotic interactions between microbes and host mosquitoes. He uses next generation sequencing (NGS) approaches for characterizing taxonomic composition of microbiota. In addition to using bacterial 16S ribosomal RNA gene tags to profile bacteriome in the microbiota, his group is exploiting NGS shot gun sequencing to comprehend taxonomic and genetic repertoire of mosquito microbiome in different vector mosquitoes.